Five years ago, a poor man living in a van came to Birmingham with 50 bucks in his pocket. He looked around him and said, "This city needs something it doesn't have." That thing was a bike. But not just any bike...A tall bike. And so goes the tale of the birth of Birmingham's Tall Bike Joust. When Marcus Fetch founded Redemptive Cycles, the city's nonprofit bike shop, he conceived of the Tall Bike Joust as a fundraiser for the shop's charitable services. In Redemptive Cycles's first year, the madman bike mechanic took two bicycle frames and welded one on top of the other into a towering Frankenstein creation. This was the first tall bike Birmingham had ever seen, and the city, alive with a revitalized energy, embraced the new event. At the very first Tall Bike Joust in 2012, contestants mounted Marcus's steel beasts to ride at each other wielding long poles blunted by pillows. They fought to stay on their bikes and to knock their opponents off. They rode for glory, honor, and fame. 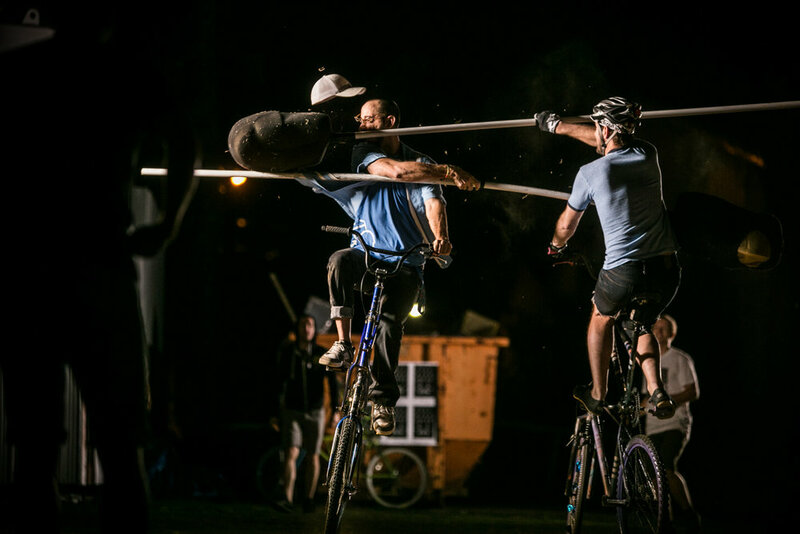 At each of Redemptive Cycles's Tall Bike Jousts, the crowd has gone wild with excitement over an event that strikes the perfect balance between silly and epic. It's become a Birmingham tradition, and on Saturday, October 14th, Ghost Train Brewery will host the city's fifth annual Tall Bike Joust. This is the must-see sporting event of the season. There are some awesome things to look forward to about this year's joust. First, the all new, custom designed tall bikes built in-house at Redemptive Cycles, which will be available for purchase after the joust for the avid collector of bicycle oddities. Second, a jousting roster filled with seasoned veterans and newbies alike - and the first ever female contenders! Third, a Tall Bike Joust beer on tap at Ghost Train, created and brewed specially for this event. The Joust proceeds on a bracket system, where jousters are paired together randomly and receive points based on their ability to stay on their bike and knock their opponent off. Those who gain the most points proceed to the next round until only one champion remains. The Final Boss is Marcus himself: the winner will ride against the godfather of the Tall Bike, and will take home $100, a hand-made trophy, and a lifetime of glory. Tickets are $5 in advance at Redemptive Cycles or at Ghost Train Brewery, and they can also be purchased online through the Facebook page or Eventbrite. They'll be $10 at the door. The event is Saturday, October 14th at Ghost Train. Doors open at 6:00pm and jousting begins at 7:30. Check out this video by Redpath Creative, and stay tuned on social media for chances to win free tickets. Follow Redemptive Cycles and Redpath Creative on Facebook and Instagram for more information.